(Bloomberg) -- Investors scouting for the best way to trade the Brexit delay should just look across the U.K. border -- at Ireland’s bonds. The securities are seen as offering the right mix of safety and returns as the deferral of Britain’s exit from the European Union dispels anxiety over the most contentious Brexit issue -- that of the Irish border. Ireland’s debt, rated higher than peripheral euro-area markets such as Italy, has outperformed other semi-core markets such as France and Belgium this year. Morgan Stanley sees Irish bonds extending the gains amid optimism the U.K. and the EU and will avoid a disruptive Brexit after agreeing last week to delay the departure to Oct. 31. The bank recommends buying Ireland’s 10-year debt and selling similar-tenor Belgian notes, while JPMorgan Chase & Co. suggests going long five-year Irish securities against sales of comparable French ones. Ireland’s buoyant $334-billion economy will add to the allure of its bonds, Morgan Stanley strategists Tony Small and Robert Brown wrote in a note. Dublin-based think-tank ESRI sees the nation’s gross domestic product expanding 3.8 percent this year, compared with the International Monetary Fund’s forecasts for euro-area and U.K. growth rates of 1.3 percent and 1.2 percent, respectively. The yield premium on Irish 10-year bonds over German bunds has narrowed to 52 basis points from a high of 78 in February. 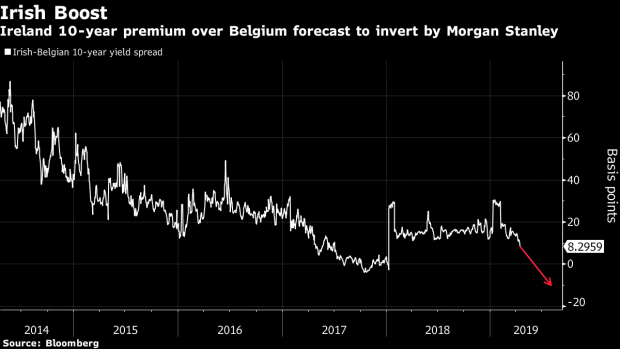 The U.S. bank sees Irish 10-year yields slipping below Belgian equivalents, pushing the spread between the two as far down as minus 10 basis points -- a level last seen in 2007. The gap is currently at seven basis points. Ireland’s 10-year yield was at 0.59 percent Monday. JPMorgan prefers buying five-year Irish bonds and selling same-tenor French ones “on expectation of lower Brexit noise providing room for further Irish outperformance,” strategists Aditya Chordia and Francis Diamond wrote in a note. They favor the five-year maturity, expecting the gains in the benchmark 10-year sector to be limited due to a potential increase in supply via auctions.